Want to Make a Difference and Help Wildlife? Grab Some Reusable Grocery Bags! The simple choice to switch to reusable grocery bags can have so many positive ramifications and will lead the way to big changes for wildlife. From reducing litter and greenhouse gases to increasing the use of sustainable materials, reusable grocery bags are the smart choice as far as wildlife is concerned. If you really want to make a difference, it’s time to grab some reusable grocery bags! Reusable Grocery Bags Prevent Litter. Disposable plastic bags are recyclable. However, more often than not single use plastic bags end up as litter. Blame it on the lightweight material that easily gets carried off by the wind or the difficulty to recycle these single-use bags since not all recycling locations accept them, but optimistic estimates put the recycling rate of single-use plastic bags at 20 percent. When single-use plastic bags are carelessly tossed aside they damage the environment and put animals and other wildlife at risk. This creates a mess that no one wants to see. While recycling of single-use plastic bags is on the rise the only definite way to ensure disposable plastic bags do not end up clogging waterways, wreaking havoc on ecosystems and possibly even messing with our food chain. 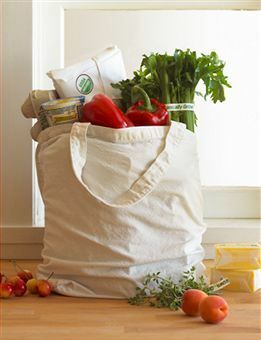 Reusable grocery bags easily do the work of disposable plastic bags all without any of the drawbacks. When shoppers make the switch to reusable grocery bags there is a sharp decline in litter, which translates to fewer opportunities for animals to mistake them for food and die as a result. Reusable Grocery Bags Preserve Habitats. By some estimates Americans go through 100 billion single-use plastic bags annually. These bags are made from petroleum and natural gas – both of which are nonrenewable resources. During the manufacturing process of the thin plastic film, greenhouse gases are released and these increased gases cause all sorts of trouble in the atmosphere from damage to the ozone layer and temperature fluctuations. These environmental changes can ruin habitats. Temperature changes may impact the types of plants that grow which can drive away the animals that depend on specific types of plants for food and when those animals go that will negatively impact animals further up the food chain. Single-use plastic bags can set off a chain of events that damage habitats and food chains and simply switching to reusable grocery bags can put an end to these problems. Sustainable Materials Reduce Greenhouse Gases and Create Breathable Oxygen. Fabric like jute, bamboo and cotton are made from sustainable fibers which means they are made from renewable plants that can be grown and harvested again and again, so there is a constant and new supply of the fiber. Sustainable plants take in carbon dioxide, which is a greenhouse gas, and convert into the oxygen we breathe. When you choose reusable grocery bags constructed from a sustainable fabric, you are perpetuating this process and in turn helping the environment and wildlife. One disposable plastic bag can do so much damage from altering the conditions of the atmosphere and ecosystems and causing litter which can be mistaken for food. One reusable grocery bag can do the work of hundreds and possibly thousands of disposable plastic bags and by default reduce the negative impact of plastic bags. These are just three ways reusable grocery bags help wildlife. Can you think of other ways reusable grocery bags help wildlife? Let us know in the comments and feel free to reach out for a quick quote HERE. Next Next post: Why Are Single Use Plastic Bags Being Banned Across the World?